The Rex Typewriter Company launched its portable National Typewriter around 1916. It was a very straightforward three-bank portable with a double shift. The model 5 that appeared in 1920 was also sold in a completely nickel-plated version. 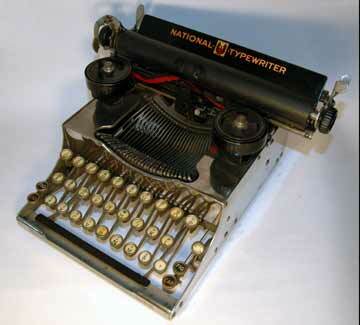 The regular Nationals are not the most sought-after collectable typewriters, except for the nickel-plated version. It is one of those machines that is appreciated more for its looks than for its historical relevance. The National was also marketed as the Crown, Express and Portex.